An electric griddle is a handy tool to have in your kitchen if you like to cook substantial breakfasts on weekends. It helps you get large amounts of food out fast because you have a larger cooking surface to hold multiple pancakes, eggs and strips of bacon. However, when you cook and serve breakfast for even more people, it’s tough to have everyone eat at the same time and keep the first batches of food warm until you start eating. To help with that, we show you the best electric griddle with warming tray options so that you can transfer a cooked batch to the attached tray that keeps it warm until you finish the next batch. When you’re ready, many of these trays or warming drawers can be detached and used as serving trays, and everyone can sit down together to eat. Just as with regular electric griddles, the most important features to look out for is whether the cooking surface is durable, easy to clean, and whether cooking is even with the temperature easy to control. There should be a large enough removable drip tray that catches grease runoff while food cooks. When it comes to the warming drawer, it should also be removable and large enough to hold at least one complete batch of food. 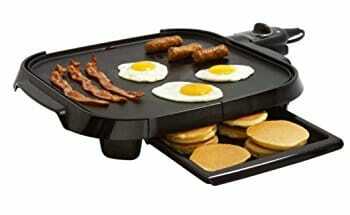 We have three top rated griddles with warming tray for you to choose from. The Oster DuraCeramic electric griddle in apple red or white is an affordable griddle with a natural ceramic non-stick coating that does not peel. Furthermore, the surface is four times more durable than those non-stick coatings used in the conventional electric griddles, and it is free of Polytetrafluoroethylene (PTFE) and Perfluorooctanoic acid (PFOA) that are harmful to your health. Oster’s electric griddle’s cooking surface measures 18.5 inches long and 10 inches wide, while its overall size measures 24 inches long, 13.4 inches wide, and stands at 3.8 inches tall. The griddle’s large cooking surface gives you the freedom to prepare enough food quickly for a family, whether it is small or large. The sliding warming tray below the cooking surface is also PTFE and PFOA-free and keeps freshly cooked food warm until you’re ready to serve it. It is large enough to hold 6-8 standard sized pancakes at a time. It measures 14″ x 7″ and is about 1″ deep. In addition to the large size, this Oster electric griddle model features an inbuilt grease channel that drains excess oil from your meal into a detachable drip tray. It also features helpful ergonomic handles to use when cooking or serving your meal. Its adjustable temperature control is another useful feature that makes Oster’s griddle an attractive option for your kitchen. The temperature control lets you cook different meals like pancakes, eggs, or bacon under the recommended temperature range. You can remove the temperature probe before cleaning the electric griddle or before serving your meal. The unit is not submersible in water but the trays are removable for washing. The rest of the unit can be wiped clean. You might want to buy this electric griddle with warming tray because of its scratch-resistant finish that maintains its new appearance for long, and its compact size that lets you store the electric griddle inside your kitchen cabinet. Also, the griddle is easy to clean, energy efficient, and cooks 20% faster than most conventional electric griddles. The griddle is powered by 120v and a one-year warranty backs it. Like most of the top rated electric griddles in the market, Oster’s Dura Ceramic Griddle does not lack its downsides. For instance, its temperature probe may fail or malfunction after some time, and the griddle may loose its nonstick ability after a period of use. The latter issue is easily solved by cleaning the surface periodically with a mixture of dish washing soap and baking soda. A few customers say that there a hot spots and that the center gets hotter than the edges. If you don’t mind spending just a little bit more to avoid temperature hotspots, Faberware’s family size griddle would be alternative to consider in place of Oster electric griddle. Faberware’s black colored family-size electric griddle with warming tray has a cooking surface measuring 14 square inches, which is probably why there are no obvious hot spots to be found on it. While customers from a year ago said that cooking is uneven, Faberware seems to have fixed this problem. The generous size lets you prepare meals like pancakes, egg omelets, sausages, and any other meal for your small or average sized family. This electric girdle features a scratch resistant and nonstick coating that is washable, and it will retain its new looks after a period of use. The surface is free of toxic chemicals that can contaminate your food. Moreover, Faberware’s family-size electric griddle features an inbuilt drip tray that collects excess grease for easy disposal, and its ergonomic handle gives you the control you need when cooking or serving a meal. Its temperature probe lets you cook your meal in the required temperature range, and the probe detaches easily to let you submerge the griddle when cleaning. Other notable features on this electric griddle include the indicator lights that let you know when your griddle is powered on and when it is ready for you to add food once the desired temperature is reached. The electric girdle also has a quick release control and a warming drawer to keep your food warm while you continue cooking. Faberware’s family- size electric griddle runs using 120V and the whole griddle measures 18.9 inches long, 16.6 inches wide, and stands at 4.3 inches tall. Its small size consumes less storage space. The common flaws associated with this electric griddle include the small sized grease catcher that requires regular emptying, and the small size of its warming drawer that does not hold much. Presto’s Griddle with Warming Tray costs the most of all these options, but that’s because its warming tray is multifunctional. Like other electric griddles reviewed above, Brentwood electric griddle has a removable warming tray that keeps your food warm as you proceed with your cooking. But it doesn’t stop there. If not used as a warming tray, this hinged part can be made to stand upright to serve as a spatter screen when cooking bacon or it can be completely folded over any food that you cook along the back edge so that you can do some steaming of the top of eggs, or melt cheese on toast, etc. The teflon cooking surface is 14″ by 15″ and is removable for cleaning and is dishwasher safe. The overall unit measures 19.25 x 16.62 x 3.5 inches. It is great for regular use, as the surface is very durable and it is easy to use. Other notable features on this best electric griddle with warming tray include the single temperature control that is easy to use and removable. While most users rate the Presto Griddle and warming tray very highly, a few customers say that it cooks unevenly, with the center being cooler than the edges.